​The Story of Hanumānāsana (Monkey God Pose): a posture named for the monkey deity Hanumān. 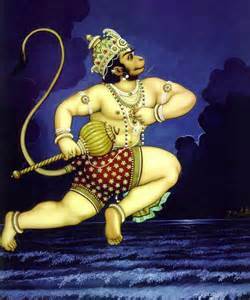 Hanumān is an unforgettable character in the great epic, Rāmāyaṇa; he is a symbol of courage, loyalty, humility and devotion. According to legend, when Rāma, the incarnation of Viṣṇu, his wife Sītā and his brother Lakṣmaṇa are in exile in the forest, Rāvaṇa, the demon king of Laṅkā, kidnaps Sītā. Hanumān, the son of the Wind god, as the friend and devoted servant of Rāma, goes in search of Sītā. After learning the where abouts of Sītā, Hanumān assumes a gigantic form and makes a tremendous leap across the ocean to Laṅkā and finds Sītā in Rāvaṇa’s garden. An army of monkeys build a bridge across the ocean with floating stones which the name of Rāma has been written. Rāma and his group cross the bridge. After a fierce battle, Rāma annihilates Rāvaṇa and Sītā is rescued. During the battle against Rāvaṇa, Lakṣmaṇa is severely wounded by an arrow and lays unconscious. With his colossal leap, Hanumān reaches the Himālayas and brings back with him the mountain where powerful life-restoring plant grows. Thus the life of Lakṣmaṇa is revived.